January 17, The Iran Project – Officials, media and rights activists robustly denounced US jail of Iranian news anchor and journalist Marzieh Hashemi, urging her immediate release. Marzieh Hashemi working for Iran’s English-language Press TV television news network, who is an American national based in Tehran, has been detained and imprisoned by US federal agents for unspecified reasons while on a visit to the country. Press TV news network, Iranian Foreign Ministry, FM Javad Zarif, the Association of Iranian Journalists, Hezbollah’s Media Relations Office, the Islamic Human Rights Commission (IHRC) and the Islamic Radios and the Islamic Radios and Televisions Union are among top protesters. Press TV’s chief, Peyman Jebelli, said the Iranian English-language news network will take any necessary legal action to secure the release of its anchorwoman who has been jailed in Washington on unknown charges, holding the US responsible for her health. “We have been informed that she is being kept in prison under very tough conditions and without any charges,” he stated, exclaiming that Hashemi had been forced to remove her hijab – compulsory for Muslim women under Islamic dress code — not only when she was being photographed but also during her detention. “Despite the fact that she has declared to prison authorities that she cannot eat pork as a Muslim, they have told her that it’s the only food available. As far as we know, she’s been eating only biscuits,” he added. 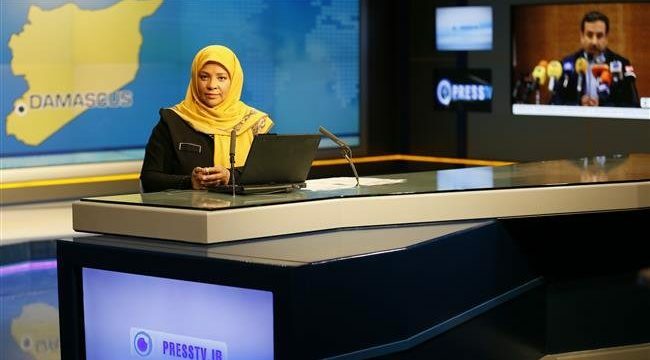 Press TV released a statement with regard to the imprisonment of its anchorwoman and voiced its strong protest at the recent apprehension and violent treatment of her. Meanwhile, ranian Foreign Ministry Spokesman Bahram Qasemi condemned the US for the arrest of Press TV correspondent and called for her immediate and unconditional release. Foreign Minister Mohammad Javad Zarif has also slammed as a “political game” the US imprisonment of Press TV anchor, urging American authorities to release her right away. Moreover, in a statement released, Hezbollah’s Media Relations Office described as arbitrary the detention of Hashemi, denouncing the US authorities’ offense against the journalist’s beliefs. “The Media Relations of Hezbollah expressed support with fellow Hashemi and her family, as well as with our dear colleagues in Press TV channel,” the statement said. In a meantime, Hashemi’s family members and media activists have launched a social media campaign with the hashtags #FreeMarziehHashemi and #Pray4MarziehHashemi in support of the detained journalist. In a statement issued, the Association of Iranian Journalists decried the United States, which calls itself an advocate of human rights, for forcing the Muslim journalist into taking off her headscarf and keeping her in manacles. Meanwhile, activists have launched a campaign to urge the United Nations Working Group on Arbitrary Detention to request their immediate intervention in the detained journalist’s case. The Islamic Human Rights Commission (IHRC) said it had already has written to the UN Rapporteur on Arbitrary Detention with regard to Ms. Hashemi’s imprisonment. In a statement, the Islamic Radios and Televisions Union also deplored the journalist’s arrest and “called for the widest media solidarity campaign” to help secure her release. According to her family, Hashemi, most famous for anchoring news programs and presenting shows for Press TV, was detained upon arrival at St. Louis Lambert International Airport in St. Louis, Missouri, on Sunday (Jan. 13). She had arrived in the US to visit her ill brother and other family members. Her relatives were unable to contact her, and she was allowed to contact her daughter only two days after her arrest. Hashemi, US citizen born as Melanie Franklin, who has been living in Iran for years and is a Muslim convert, has told her daughter that she was handcuffed and shackled and was being treated like a criminal.